Battlelands01981 240896 work Paint BallAt Battlelands we offer a fun day out paintballing and laser clay shooting at affordable prices – all based in our 60 acres of picturesque countryside in the Golden Valley. Our Battlelands venue is perfect for hen, stag and birthday parties looking for a memorable way to celebrate, as well as groups of friends looking to break out of usual routines and opt for an action-packed day out. We welcome school groups, corporate days out and offer team building activities. 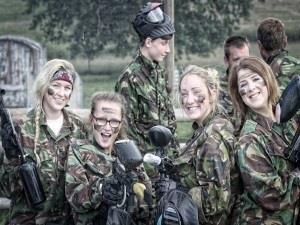 We kit you out, provide all necessary equipment and safety gear and the first 100 paintballs are free – happy days! We’ll even take the photos and burn them on to CD so you can share the experience with friends and family and on social networks. Our Laser Clay Shooting is ideal entertainment for groups of 10 to 30 – and we can even come to you! The electronic score board keeps track of the 5 people shooting together – who will hit the most clays or have the fastest trigger finger? Our Laser Clay Shooting is an unique way to celebrate your wedding. It’s a great spectacle, guests will be entertained whether they choose to take part or not. Paintball and laser clay fans and novices, give us a call to discuss your requirements – we will be delighted to entertain you.